The goal of the 2016 campaign at Gird-i Bazar was to gather more information on the general layout of the site, the functional organization and architecture of the buildings as well as the human activities inside and outside the buildings. 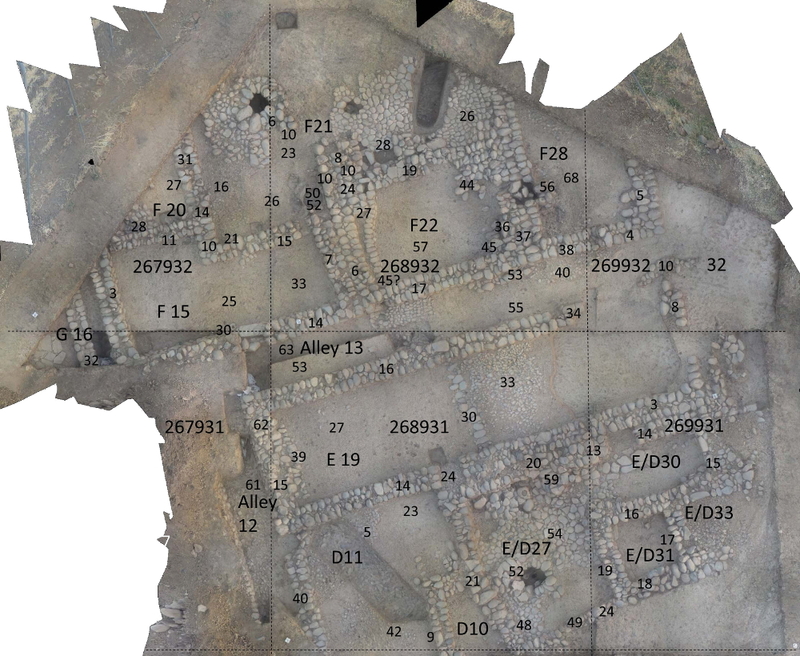 During the first season of rescue excavations at Gird-i Bazar in 2015, we identified nine buildings (only partially excavated) around an open space containing a kiln. Three buildings (Buildings A-C) are situated on the eastern side of the site and six on its western side (Buildings D-I). In the eastern trench, work concentrated on Room 3 of Building A, in the western trench Room 17 of Building H was investigated intensively. Between the buildings run uncovered alleys. After the first campaign we assumed that the houses were single-room buildings, but this was a preliminary and tentative assessment as most of them had been only partially excavated. During the 2016 campaign, we targeted the area east of Building A, in the eastern trench, because the wall Locus:271927:008 continued into the eastern baulk. During the first part of the campaign, Alessio Palmisano excavated in squares 271927, 272927, and 272928. After his departure, Janoscha Kreppner and Andrea Squitieri continued the work in the eastern trench to remove the baulk between squares 271927 and 271928, and to further investigate Courtyard 2 and Room 29 after several younger graves had been excavated. In the western trench, we decided to investigate further Buildings E and F. Vera Egbers supervised the work in Building E, which is located east of alleyway 12. Zahra Hashemi was the trench supervisor in Building F, north of alleyway 13. Silvia Amicone excavated the kiln found in the 2015 connecting trench, which had only been partially excavated in that year. Francesca Chelazzi supervised the expansion of the connecting trench between the kiln and the buildings of the western trench. 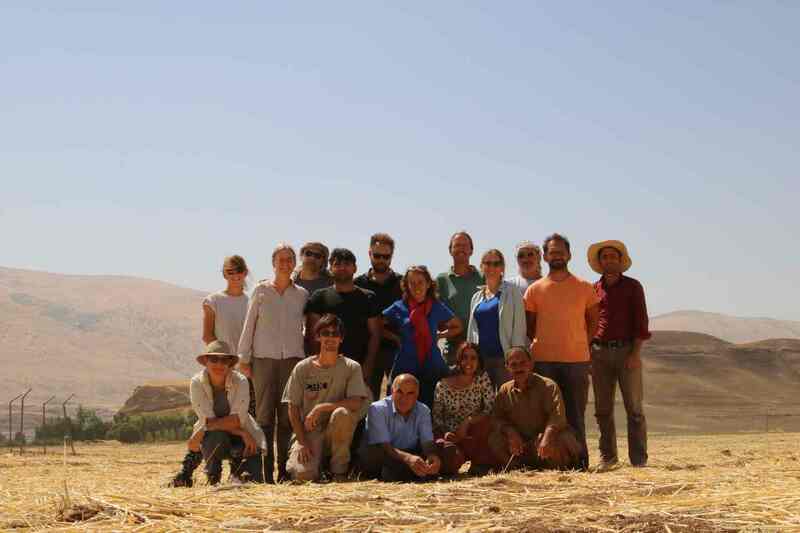 Besides the excavation, following studies were conducted: small finds supervised by Andrea Squitieri, pottery processing supervised by Jean-Jacques Herr, residue analysis by Elsa Perruchini, geophysics by Jörg Fassbinder and Andrei Asandulesei; bioarchaeology by Tina Greenfield and Melissa Rosenzweig, geoarchaeology and offsite studies by Mark Altaweel. In squares 271927, 272927, and 272928, during the main occupation period, there was a multi section architectural complex composed of three single-room buildings (3, 23, and 24), an alley (25), two open areas/courtyards (1, 26), and one building J to the east of alleyway 25. This area seems to be divided into a northern and southern part by a big architectural unit 1. This architectural unit is a 12 m long wall separating the building A, the courtyard 2, and the room 24 from the Open Area/courtyard 1, and the Room 23. Another architectural unit 2 is composed of the wall Locus:272927:009 and Locus:272928:003 bonded to one another but separated from the architectural unit 1. The architectural unit 2 is a 6 m long wall flanked by the alleyway 25. The main occupation period with alterations as witnessed by the fill of the pit LGR:0014 in the open area/courtyard/room 1. 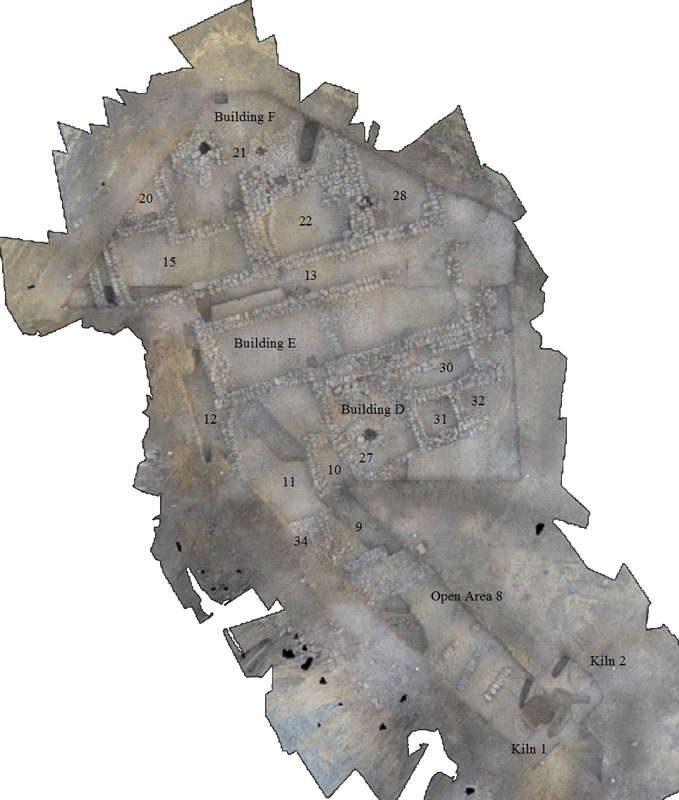 A period of abandon during which the ruins of the main occupation period were covered by a thick layer of filling. One or more later occupation periods during which 12 graves were cut into the archaeological levels of squares 272927 and 272928. The excavation of the baulk between squares 271927 and 271028 revealed continuing floors between the northern and the southern portions of room 3 and courtyard 2, and some interesting installations. One worth mentioning is a possible drain running roughly east-west across courtyard 2 and possibly starting in Room 29 to the east. Another installation found is a circular installation, perhaps a well, in the same room, which may have been connected to the drain mentioned above. These features, as well as floors, belong to the main occupation period of Gird-i Bazar, dated to the Iron Age. 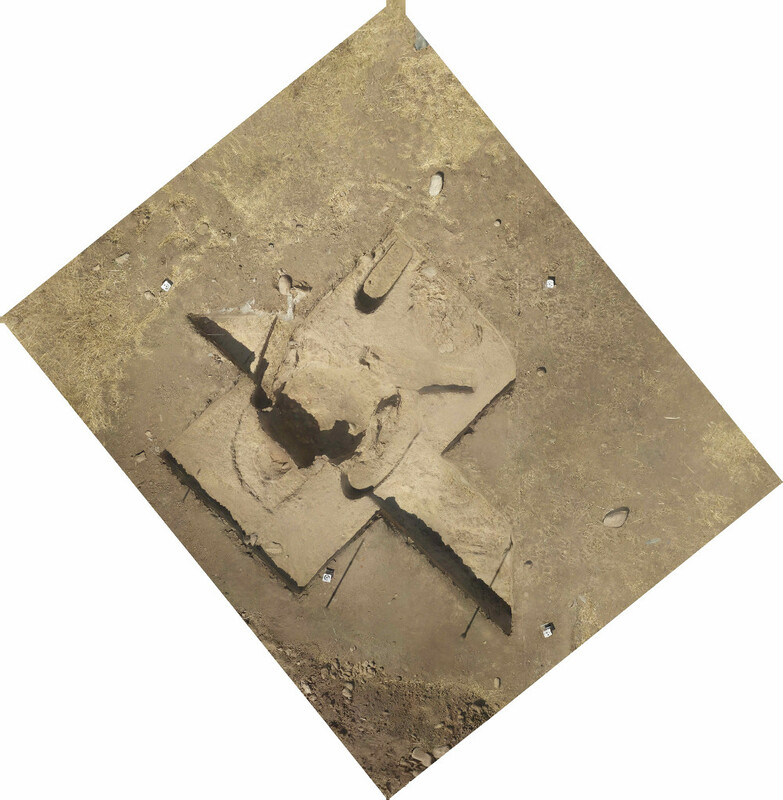 After a period of abandonment represented by fills covering the floors, the area was sporadically used under Saddam as indicated by a small surface yielding Iraqi coins and a stone accumulation connected to it. Building F is a complex building with at least three rooms (Room 15, Room 20, and Room 22) and one courtyard (Area 21) which contains a well in its center and a cooking place with two ovens to the south. A fourth room (Room 28) is only partly excavated and seems also to have been a cooking room with an oven. All the rooms have walls made of two rows of stones. The walls located in the western part of the building are preserved with more courses of stones than the walls located at the eastern part. This seems to be the case because this part of site is on a slope rising up from west to east. The floors of this building likewise slope up from west to east. In the southern part of the courtyard and north of room 15, a cooking place with two circular ovens made of burnt clay was found (Locus:268932:050, Locus:268932:052). To the west of these ovens many pottery sherds were found lying on the floor, including two complete pots in fragments. This area is closed on three sides but opens to the north towards the courtyard. North of Room 15 there is a second entrance that gives access to courtyard 21. This courtyard contains a well in its center made of stones and with a circular shape. The floor of this courtyard is paved with stones around the wells, while in the rest of the space the virgin soil serves as the floor. A rectangular stone with a circular depression was found in a hole located under the stone floor east of the well. We suggest that this hole and the stone in it are what remains of a device for pulling water. Last year “Building E” was expected to be another single-room unit similar to so-called Building H; Imagine our surprise when we unearthed a rather large structure of yet unknown purpose. This unexpected difference in size and internal layout altered our previous assessment of the site quite early during the season. The excavation in this area revealed a huge (ca. 14.45 x 4.30 m) rectangular house that contained almost no finds, but two stone installations. The first was a row of big cobble stones, stretching across the room and interpreted as a drain system (Locus:268931:030). This was most probably connected to a well (Locus:268931:052) found in the neighboring architectural unit to the south and terminating in the alleyway north of building E.
During the second half of the excavation season, another architectural unit (Building D), consisting of so-called rooms 27, 30 and 31, was excavated which may be connected to Building E. Special installations in this unit were the already mentioned well (Locus:268931:052), which consisted of big cobble stones arranged in a circle, with an inner diameter of 70 cm. Within this room, a roundish stone installation (Locus:268931:059) may have served as a shelf or the like. On the stone floor many objects relating to everyday activities were found, for example a pounder, a polisher, pottery fragments and potentially a large pottery-stand. The small room 31 (1.65 x 1.65 m) was almost completely occupied by an oven (Locus:269931:025), which supports the interpretation that this unit may have been a workshop area. 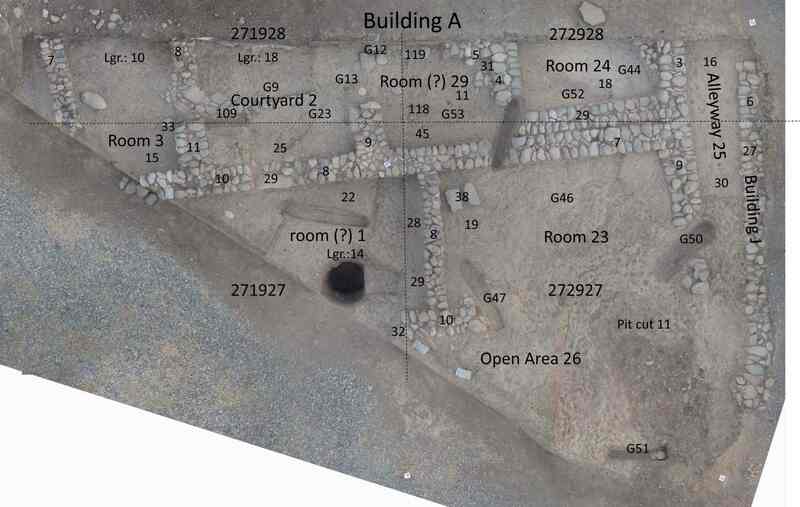 The aim of this trench was to obtain a complete plan of the kiln structure partially excavated in 2015 by Adam Stone, and gain more information about its relation to the rest of the excavated areas. 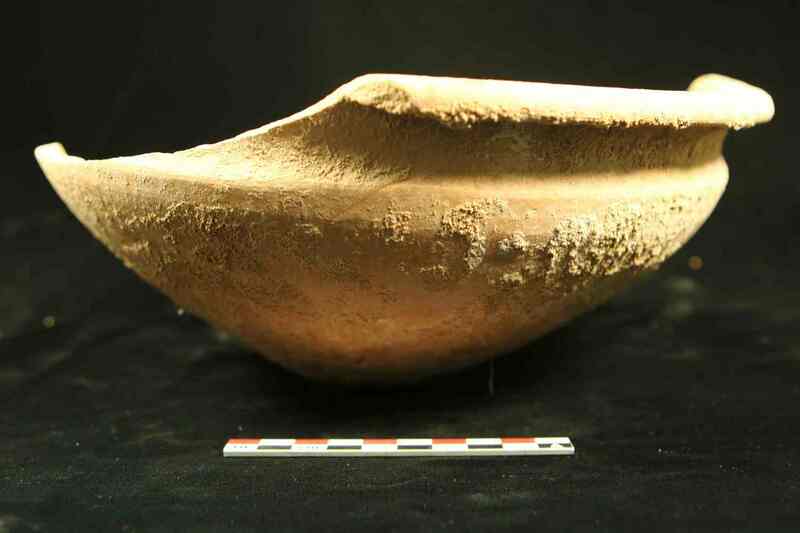 During the investigation of the south-eastern portion of the kiln it was possible to detect parts of its 5-10 cm thick clay lining, which was burnt red on the outside and hard white on the inside. Moreover, it was possible to identify different parts of the original kiln grate. Part of the grate was still in situ, whereas other parts were found in different levels of the filling. In addition, the back wall of the kiln was detected, where a hole was cut into the wall in order to provide an aperture through which the smoke could get out while the kiln was in use. Behind the kiln wall and in connection with the above mentioned hole, we registered a small semi-circular plastered structure with a slightly concave upper surface. In the south-eastern portion of the kiln, the kiln's filling was excavated, which had been only partially detected in 2015. The lower portion of this filling consisted of an ashy grey layer rich in carbon; no pottery was found in this locus. The filling above this locus, however, was very rich in pottery and even a number of complete and stacked vessels were found inside it (probably the last charging of the kiln). They were found together with several fragments of the kiln grate showing clear signs of vitrification. In the upper portion of the filling more pottery fragments were found, but these were increasingly fragmented. Additional fragments of the kiln's grate as well as animal bones were recovered from this locus. Samples were collected from both the kiln fill and the structure and await in-depth archaeometric analyses to be carried out by Silvia Amicone. On September 9th, the excavation of a longitudinal trench was begun with the aim to connect the Kiln trench, located in the south-east portion of the site, to the Western trench located to the north-west. This connecting trench, approximately 20 m in length, was planned to run parallel to the 2015 connecting trench, adjacent to the south-western edge of the latter. The 2016 connecting trench was opened with two aims: on the one hand it would aid us in comprehending the spatial relationship between the “Kiln Area” and the “Western Trench”, while on the other hand it would also serve to further our understanding of the site’s diachronic development. This trench cuts across four squares, namely 268931, 268930, 269930 and 269929, and across five specific areas, which are alley 12, outdoor area 11, area 9, room 34, and outdoor area 8. As for the stratigraphic sequence, the connecting trench revealed a Neo-Assyrian main occupation phase, which fits snugly into the chronology already documented in the other trenches. 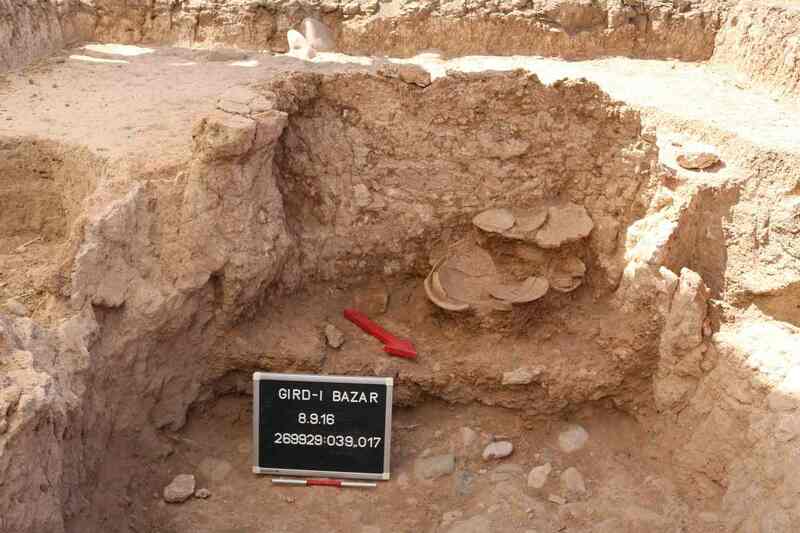 Moreover, some Sasanian potsherds found on a pebble floor connected to a wall raise the question of a possible sporadic occupation of Gird-i Bazar during the Sasanian period. In the 2016 campaign, 305 pottery collections were collected; 7809 diagnostic and non-diagnostic sherds, which correspond to 130 kg of material, have been collected and sorted by fabric group. 10 complete profile vessels have also been recovered (figure 7). These numbers are considerably higher than in 2015, providing us with much more information about the pottery culture at Gird-i Bazar. A preliminary analysis of the diagnostic sherds conducted in the field by Jean-Jacques Herr revealed that they belong to the same forms and fabric types as those found in 2015. Unlike in 2015, the 2016 Gird-i Bazar season was particularly rich in single finds and collections of objects other than pottery. From the contexts pertaining to the main occupation period 99 objects were collected. Stone objects represent by far the majority among them, with a total of 21 flints and 41 groundstone tools (total 61). 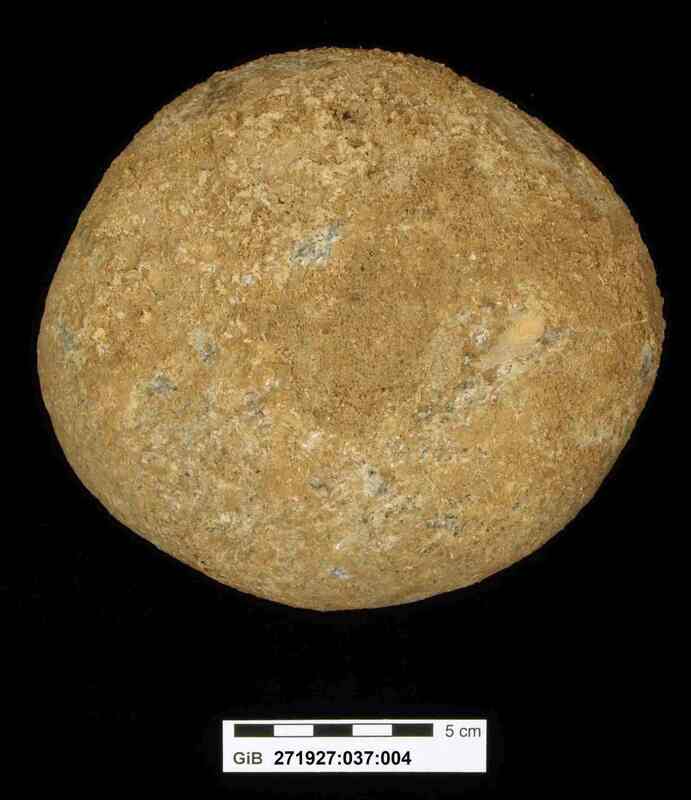 Stone objects other than groundstone tools are sub-spherical weights and few possible pendants. Although detailed statistics are as yet in progress, it seems that the groundstone tools of the 2016 season follow the trend already observed in 2015, with pounders and pebble mortars (figure 8) constituting the majority of them. The striking absence of the typical domestic stone tool kit (that is querns, handstones, large mortars and pestles) may indicate that either these tools were removed when the area was abandoned or that they were used in an area not yet excavated.